Fall is the absolute best time to do any seeding in your lawn. The warm days and cool nights along with the timely fall rains provide perfect conditions for new grass to germinate. In Springfield our seeding window is short. The best time to seed is between September 1st and October 20th. The earlier the better. For the best possible seeding results, follow the ClassicLawns step by step guide on seeding! Before You Start. Think It Through! Decide how much of your lawn you are going to seed. Watering is crucial to new seed. If you have a sprinkler system, great no worries. If you have to drag hoses, skip down to the watering instructions before you start. 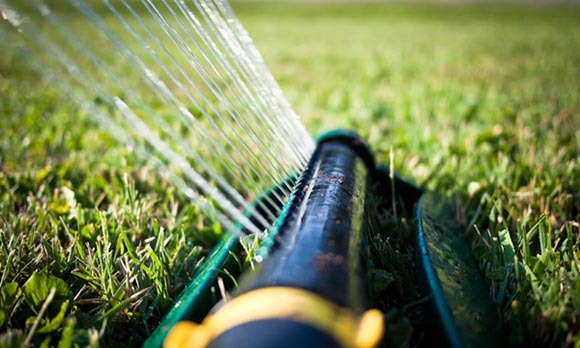 You may consider only seeding a portion of your lawn, so you can water properly! Prep your Lawn. We Are Ready Doctor! Mow your lawn short (2”) and bag the clippings if you can. If you don’t have a bagger, mow twice to break up clippings. Mowing short ensures the seed gets down to the soil. Plus, it stunts your lawn just a little bit so that seed can compete with existing turf. If you have a sprinkler system mark your sprinkler heads with flags so they don’t get hit by an aerator or verticutter. Water your lawn well for 2-3 days before seeding. SEEDING WORKS BEST IN A MOIST LAWN! You should be able to easily stick a screwdriver in the ground! See our Seeding Preparation PDF for more detailed info! Aerate the Lawn. Let’s Poke Some Holes! At ClassicLawns, we recommend core aerating your lawn once a year! 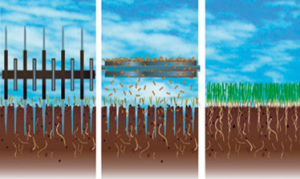 A core aeration is one of the best extras you can do for your lawn. Even if you don’t seed it is extremely beneficial. 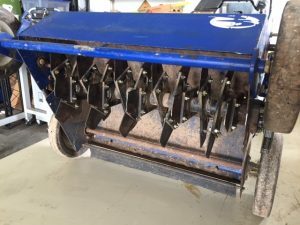 If your lawn is fairly healthy and just needs to be thickened up, core aerating is the way to go before applying seed! A core aeration pulls plugs out of the lawn allowing air, water and nutrients to reach the roots. This also helps loosen compacted soils, so roots can grow deeper. Plus, the dirt plugs that are pulled on to the top of the lawn have microbes and enzymes that eat thatch as they work their way back down. 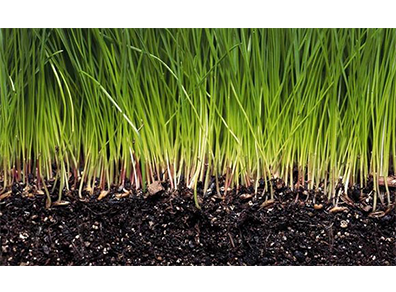 The holes that are created by aerating the lawn provide a perfect place for seed to germinate. In fact, you are almost guaranteed that seed will come up in these holes even if you do a poor job of watering! Apply Seed, but Not Just Any Seed! In Springfield, MO our only real option for seed is Turf-Type Tall Fescue. This type of fescue has a very deep root system that can handle drought, it is very disease resistant, and the new varieties are almost indistinguishable from bluegrass. DO NOT USE SHADE GRASSES OR RYE GRASS! These grasses will not stand up to our summer heat and they are very disease prone. You can try to use bluegrass, but it also does not do well with our HOT summers. DON’T GO CHEAP! We seed often here in the Midwest due to our tough summers. Seed companies know this, and we are the dumping ground for junk seed. All seed bags have a label that will tell you the percentage of seed varieties are in it. This label will also tell you how much weed seed and crop seed are in the bag. You want 0% weed seed and 0% crop seed. These percentages are done by weight. So even .01% weed seed could be 250 seeds that you will be planting in your lawn. Spend the extra money for good seed. We would prefer you use our seed. We will sell it to you and deliver it right to your house for less money than you will spend at a local hardware store. Get the right amount of seed. Turf-Type Tall Fescue is seeded at 4-10lbs per 1000sqft. We almost always apply on the high side. So, a 10,000sqft lawn needs up to 100lbs of seed! To Verticut or To Not Verticut? We Love Quoting Bill Shakespeare! e best process. 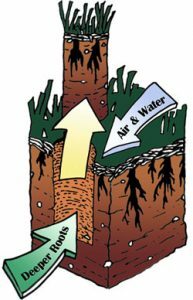 You may also choose verticutting over aerating if you have shallow sprinkler or utility lines since the groves are only around a ¼” deep. Watering new seed properly is crucial with verticutting because seed is much more shallow in the soil. DO NOT USE A POWER RAKE! Power Rake is a dirty word for ClassicLawns. A Power Rake looks like a verticutter until you look under the machine. A verticutter has rows of vertical blades. A Power Rake has fork like tines attached to springs that rip through the lawn. Yes, it pulls up thatch, but it also rips up the good grasses roots and crowns. In our opinion a Power Rake does more harm than good! Customers always ask us how much they should water and how often. Our answer is always, “We Don’t Know.” Every lawn is different. Shade, soil differences, water pressure, type of sprinkler, and other factors make giving the perfect answer impossible. Instead, here is our #1 rule for watering new seed: The soil needs to be consistently ”CHOCOLATE” colored for the next 4 weeks. So, water as much as needed to keep the soil this chocolate colored and you will have a great stand of new grass! For your lawn, that may be twice a day at first then down to once a week by the fourth week, but the rule is the same! Keep it chocolate colored. If the seed dries, it dies! However, never water so much that you create puddles. That is too much water! Mow weekly! Mowing will NOT hurt your new grass. 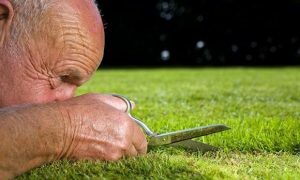 Mowing helps your new grass toughen up and mature! Mow weekly at 3.5”-4”. Leaving young grass to grow tall and then mowing it down short is very bad for baby grass. No Soccer Tournaments! While it is OK to walk on your lawn to check on watering and to mow it. Please do not hold any soccer tournaments or volleyball games on it either. Avoid any activity that would trample the grass. Keep leaves off new grass! Mow or blow any leaves off your lawn so they do not smother the new grass. DO NOT RAKE! Raking can pull up the new grass! Do not put down extra grass seed! Especially if it is not our grass seed. 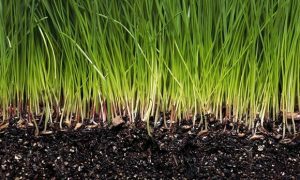 Turf-Type Tall Fescue requires 14 days to germinate. If soil temperatures are still warm, it can come up in as few as 4-7 days. 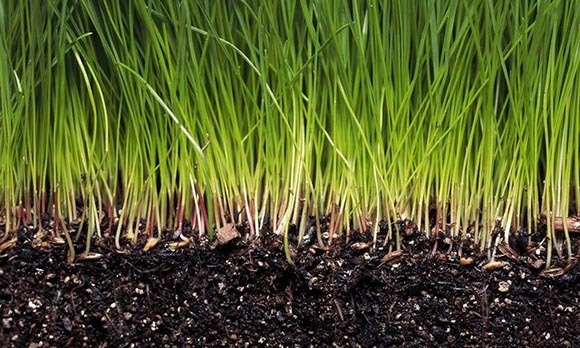 If soil temperatures are cooler, it can take as long as 28 days to germinate. Also, other factors such as how much sun the seed gets, how deep seed is buried, and how much water it gets can play a role in how quick your seed comes up. Avoid the temptation to put down any extra seed for at least a month. BE PATIENT! It all almost always comes up. On occasion, even we have an area that just doesn’t grow. Don’t worry! If we do your seeding, we will fuss over any trouble areas until we have grass! See our Seeding Instructions PDF for more info! Call ClassicLawns with Any Questions or for Help. We Like to Talk! Good luck with your new lawn! Seeding can be a challenge. We are always here to help or if you have any questions regarding seeding. Call or text us at 417-812-5321. ← Cary’s Corner – Crabgrass. The Cousin Eddie of Weeds!